It's that time again! A little earlier than expected my Snackly box came into the office. Unfortunately I was on a business trip in Manchester since Monday. As I did not get back until Wednesday night I was not aware it had came! I think the earlier box is due to an amazing salted caramel treat that has to be eaten within 7 days. So why not have a look whats in this month's box! This is the treat that has to be eaten within a week. This brownie looks like a much more sticky texture than brownies I have had recently. 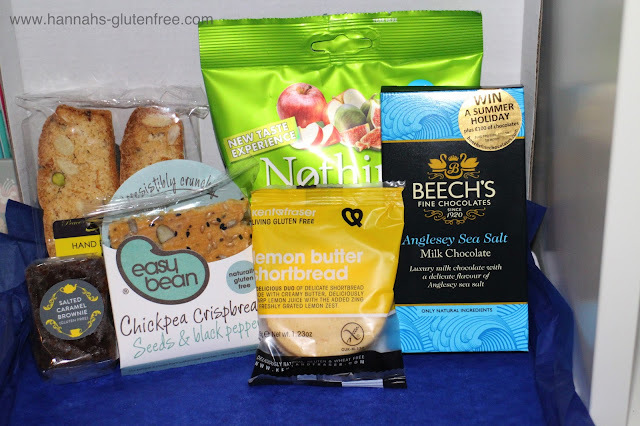 I love brownies with flavours infused, such as the Honeybuns ones as they add interest to an item which is very readily available in the gluten free market. At £2.75 a bite I am expecting amazing things! There is also a 10% discount in this box for your next order their website. We had these in the box a few months back. I did try them and I wasn't the biggest fan. There is a review I've written waiting to be uploaded. I may try them again and add a 'second try' to that post. The flavour just wasn't for me but if I try them in a different way I may change my mind! Kent and Faser featured in the box a couple of months ago with a ginger cookie which was delish! See my review here. I am looking forward to trying this twin pack as I have a love for lemon flavouring in sweet treats. This packet is a third of what you would receive in a full box so are another more luxury item at roughly £3 for this double pack. Fruit and nut sounds right up my street so I think I may have these as a weekend breakfast. There is nothing better than a coffee and Biscotti for breakfast when you are in a sweeter mood. It is like cake for breakfast! These are 100% freeze dried apple and fig pieces. I will have to ask someone to try these for me as unfortunately the last and only time I had fig, my throat started to close up! So I don't think figs like me! Which is a shame as you all know I do enjoy dried fruit. They do have some other flavours that don't contain figs or strawberries, so I may be able to find some to try here. This sounds A-MAZ-ING. Sea salt in anything is something I jump for, so to receive a chocolate bar with Anglesey sea salt was something I was so excited to see. I honestly think salt itself tastes really good and added to anything brings out the flavour even more. I will most certainly be eating this with a good film! This months snackly box totalled to roughly £8 which is what you pay for the box, not including the shipping. For finding so many great new products I think this is great value for money and also allows you have have small amount of food I would never get through a full box of. I would love to know what you received this month!